KamLAND (Kamioka Liquid-scintillator Anti-Neutrino Detector) has demonstrated convincingly that neutrinos are massive and undergo flavour oscillations. This is a profound discovery ! The experiment has determined the associated oscillation parameter Δ m221 to unprecedented precision, has helped constrain the neutrino mixing angle θ 12, and has explored the potential application of neutrinos as a geophysical probe. The detector is currently undergoing a purification upgrade which will enable KamLAND to execute a low energy solar neutrino program in parallel with this already highly fruitful anti-neutrino program. Many questions of fundamental significance remain open; but with a new understanding of neutrino propagation, neutrino science is now poised to provide illuminating answers to some of society's most probing questions concerning the Earth, the Sun and fantastic astro-physical events such as supernovae. The Solar Neutrino Problem was a fascinating mystery that motivated almost 4 decades of activity in neutrino physics. The issue was that early neutrino detectors counted fewer neutrinos from the sun than expected. As more experiments were performed and predictions were refined, evidence for a paradox between the Standard Solar Model(SSM) and the Standard Model of Particle Physics (SM) became increasingly significant. The early detectors were flavour selective; they only detected 1 of the 3 known neutrino flavour species. A mechanism which allowed neutrinos to change flavour and become invisible to the detectors was a possible way forward to explain the experimental results. Extensions to neutrino properities in the standard model were proposed which would accomodate the necessary flavour change. Neutrino flavour oscillation arising from mixing through neutrino mass states was a leading theory. KamLAND was designed to probe this family of solutions using reactor anti-neutrinos. Meanwhile other novel mechanisms, such as neutrino decay, also competed to explain the solar neutrino deficit. For a neutrino beam with energy, E, Δ m2 governs how the relative phase of the mass states in the admixture changes with time. A non-zero value of this parameter gives rise to an oscillatory evolution of the flavour content of the neutrino beam. It also implies there is at least one massive neutrino ! The positron quickly (~10's ns) deposits it's energy and then annihilates. The energy associated with this prompt event is directly related to the incoming neutrino energy. The remaining neutron thermalises and then later ( after ~200s μ s) captures on proton yielding a deuteron and a ∼ 2.2MeV photon. This neutron capture event is called the delayed event. The delayed coincidence of the prompt and delayed event pair is an extremely robust signature of an anti-neutrino. Great care has to be taken in detector design, construction and operation to accomplish and maintain the radiopurity levels required to achieve a negligable background from accidental pairing of uncorrelated singles events. However, the radiopurity requirements are much less stringent that they would otherwise be for a non-conicidence type signal. Pernicious backgrounds arising from processes that produce a delayed coincidence signal similar to that of anti-neutrinos are very important and much effort has been devoted to characterising and quantifing all such backgrounds. At lower energies, (E < 2.6 MeV), geologically produced anti-neutrinos from uranium and thorium decays in the earth must be considered. 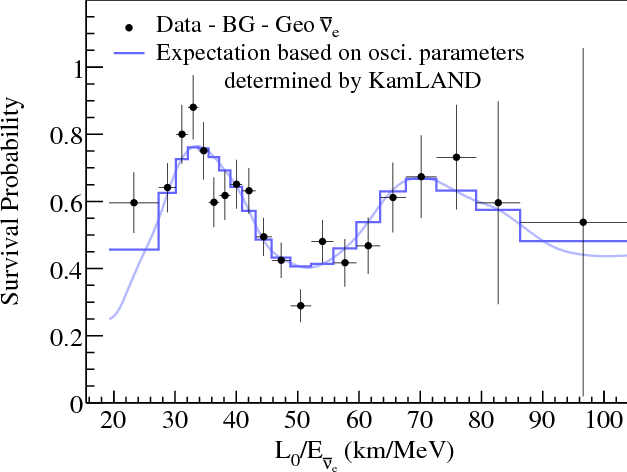 There are indications for a geo-neutrinos component in the anti-neutrino spectrum measured by KamLAND. While these are a background for the reactor anti-neutrino measurement, the detection of these would be an important milestone. The figure below shows the survial probalility as a function of L/E which KamLAND has measured. Knowledge of how the survival probability depends on neutrino energy is a powerful discriminant of the underlying mechanism responsible for neutrino disappearance. The data are best described by the LMA neutrino oscillation scenario and other mechanisms such as neutrino decay are strongly disfavoured. This result provides compelling evidence that neutrinos oscillate and that neutrinos are massive ! As mentioned previously, KamLAND has seen indications for geologically produced anti-neutrinos arising from uranium and thorium decays within the earth. Precision global measurements of the geo-neutrino flux can provide important and otherwise unattainable information about the composition and radiogenic heating of the earth's core. While this approach is still in its infancy, the KamLAND measurement was an important milestone in establishing its feasibility. There is considerable interest and excitement in the geological and physics communities about developing this technique to its full potential. Much of the recent progress in neutrino physics has been motivated by questions arising from attempts to unravel the Solar Neutrino Puzzle (SNP). KamLAND had its genesis in the desire to test a whole family of neutrino oscillation scenarios and was uniquely positioned to do this with electron anti-neutrinos from reactors. The results have demonstrated that neutrinos are massive and have played a decisive role in establishing the so-called LMA-MSW solution as the correct explanation for the solar neutrino deficit. Now that neutrino properties are better understood, precision measurements of solar neutrino fluxes are inorder so that we might rigourously test our understanding of the sun, further probe the MSW effect and search for other possible subdominant effects arising from heretofore unknown properties of neutrinos. The figure below shows the predicted solar neutrino spectrum. As the figure shows, low energy neutrinos, E<1MeV, dominate the solar neutrino spectrum, thus sensitivity in the low energy regieme is key to any precision measurement. KamLAND has demonstrated effectiveness as a calorimeter for events with energies ranging from hundreds of keV to several MeV and given its unprecedented size is well positioned to make a timely precision measurement of 7Be solar neutrinos. Such measurements represent an important compliment to those already underway at Borexino. In this environment the 7Be solar neutrino signal (red line) can be measured. 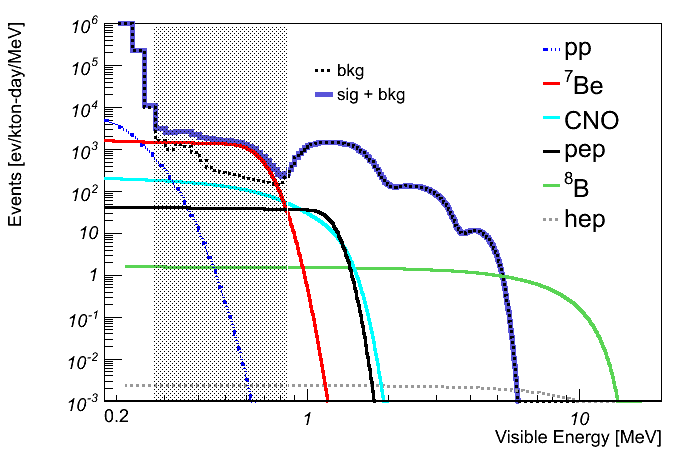 At slightly higher energy, (0.8MeV < E < 1.2MeV) the opportunity to observe events arising from pep(black) and CNO(cyan) solar neutrinos also exists. The dominant background in this case comes from 11C. 11C is a long-lived (T1/2 ~ 30 minutes) spallation isotope which is continually produced by cosmic ray muons passing through the detector. In 95% of cases a neutron is produced in association with each 11C nucleus. By rejecting events that have the right spatial and time correlation to muon tracks and neutron captures it is possible to veto most of this 11C and achieve a healthy signal to background ratio for this measurement. The success of this approach relies on very efficient neutron tagging and precise muon tracking. The collaboration is working vigourously to realise both of these requirements. Unfortunately, the pp neutrino flux lies below the sensitivity of KamLAND because of the irreducible 14 C background at very low energy. Therefore, the opportunity to measure the solar pep flux is especially tantilising as it is directly related to the pp process. By studying these tiny flashes of light generated by neutrinos in a cavern deep underground it may be possible to illuminate the driving process that is fundamental to the sun and to our lives here on earth.